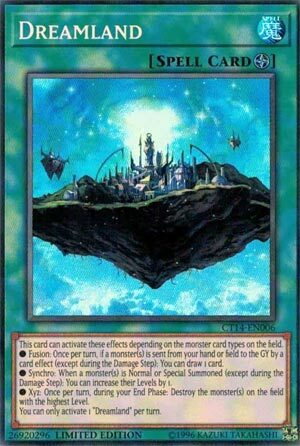 This card can activate these effects depending on the monster card types on the field. ● Fusion: Once per turn, if a monster(s) is sent from your hand or field to the GY by a card effect (except during the Damage Step): You can draw 1 card. ● Synchro: When a monster(s) is Normal or Special Summoned (except during the Damage Step): You can increase their Levels by 1. ● Xyz: Once per turn, during your End Phase: Destroy the monster(s) on the field with the highest Level. You can only activate 1 “Dreamland” per turn. Dreamland is an interesting Field Spell that can change its effect depending on what Extra Deck monster is on the field (though not a Link monster). A Fusion can give you an extra draw if a card is sent from the hand or field to the grave by a card effect. Several decks like that. A Synchro monster on the field grants you a level increase by 1 whenever a monster of yours is Normal or Special Summoned. Synchro-based effect, could be used for Xyz Summons, but mostly a Synchro effect. Could be useful for certain cards and setting up an Xyz, but not as good as the Fusion effect before it. Lastly, an Xyz on your field gives you a Smashing Ground effect on the highest level monster on the field (your choice if there are equal levels). An odd effect for having an Xyz monster on the field which has Rank instead of Level. This effect is probably the most applicable and useful of the three effects, giving you an 1-for-1 off Dreamland and a plus the following turns after. Dreamland’s best ability may be that it doesn’t require you to have the monsters in question. With the new Link Format in place this card has been watered-down. That Extra Deck Zone will likely be filled by a Link Monster first, then another monster from the Extra Deck. This card likely will now only get one specific effect because there will be only one of the criteria on the field. Can’t get rid of an Xyz with the Xyz effect of this card, the Synchro effect doesn’t deal with a Synchro, the only one that really cashes in is the Fusion, and the best Fusion that people ran is banned. D/D/D’s could spam the board heavily with choices to fire this card off for, but now they can’t. It’s an okay card, but none of the effects really grant you advantage without needing something more. Dreamland allows certain effects to be activated depending on certain card types on the field. Fusion: Once per turn, if a monster is sent from the hand or field to the GY by a card effect, you can draw 1 card. Synchro: When a monster is Normal or Special Summoned, you can increase their Levels by 1. XYZ: Once per turn, during your End Phase, destroy the monster(s) on the field with the highest Level. The Fusion effect is great for drawing cards and compensating you for your Fusion Summon, don’t know if you get it off the first Fusion monster summoned though. The Synchro effect could help Synchro plays, but Links… The XYZ effect can help get rid of a boss monster or destroy your own boss monster. This card is mediocre at best. There are far better options for Field Spells. Dreamland is a very interesting Field Magic card. It has various effects, depending on the Monsters on the Field. Fusion: Once a turn, you can Draw a card, if said type is sent from your Hand or Field to the Graveyard by a card effect, except during the Damage Step. I like this effect, and as a result of Battle would be too easy, but your opponent may not give in and do this so you can’t Draw, meaning, you may have to do it yourself. Synchro: When a Monster (or Monsters) is Normal or Special Summoned, you can increase their Level(s) by 1. This can certainly be useful, and it’s versatile, like the first effect, even with the not during the Damage Step clause. XYZ: Once per turn, destroy the Monster (or Monsters) on the Field with the highest Level. This I consider the weakest of the effects here, just because it can’t hit XYZ, for one. But destruction is good, and there’s no Damage Step prohibition here. I see this card as meh right now to be honest. Not good, but not bad all together, either. You might have to construct your Deck to accommodate this. I don’t see you just being able to throw in a copy and hope it works in your favor. But when it works, it should work rather well for the player.